>I LOVE Veggie Burgers! My family can take them or leave them so we rarely have them. Until today that. 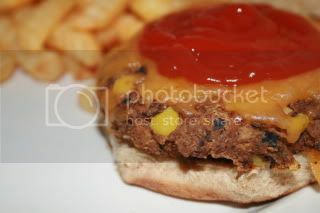 I have edited a veggie burger recipe off allrecipes.com The only person who knew these burgers were veggie burger’s was my husband and out of the 6 of us 5 of us liked them. Son #3 was being picky tonight and did not want corn so refused to eat his. Rinse and drain beans well. In a food processor finely chop green pepper, onion and garlic. Drain any excess water. Use food processor to mash beans. Transfer to large bowl and mix in egg and seasonings. Finally sir in bread crumbs, flax meal and corn kernels. Mixture will be sticky but will form patties. Form 8 burger patties. Bake on a parchment lined cookie sheet at 375 for 10-12 minutes.